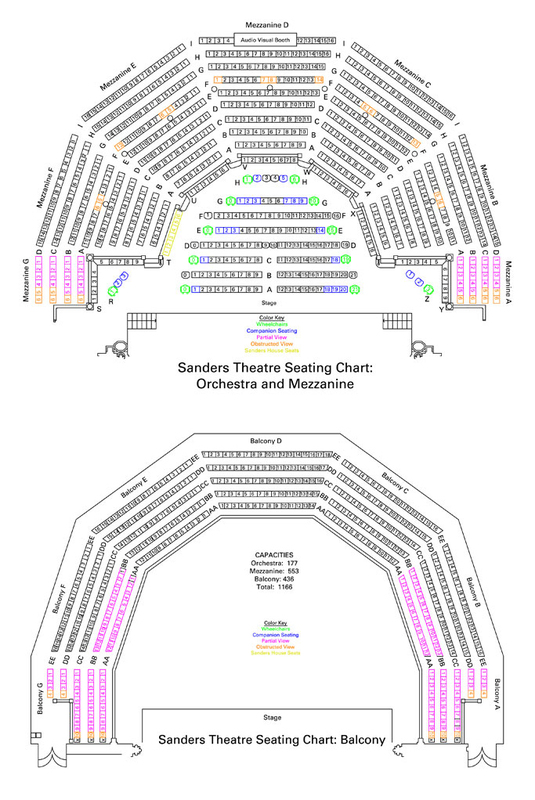 Inspired by Christopher Wren's Sheldonian Theatre at Oxford, England, Sanders Theatre is famous for its design and its acoustics. A member of the League of Historic American Theatres, the 1,166 seat theater offers a unique and intimate 180 degree design which provides unusual proximity to the stage. The theater was designed to function as a major lecture hall and as the site of college commencements. Although Sanders saw its last commencement exercise in 1922, the theater continues to play a major role in the academic mission of Harvard College, hosting undergraduate core curriculum courses, the prestigious Charles Eliot Norton Lectures, and the annual Phi Beta Kappa induction ceremony. Many of the most venerable academic, political and literary figures of the 19th and 20th century have taken the podium at Sanders Theatre including Winston Churchill, Theodore Roosevelt, and Martin Luther King, Jr. Parking is severely limited in the vicinity of Harvard Square. We strongly recommend the use of public transportation. Drive to Braintree MBTA station parking garage (Braintree exit 17 off of Route 3 coming from Cape Cod or the South Shore). Take the Red Line in the direction of Alewife to Harvard. Allow approximately 45 minutes for the subway portion of the trip. Drive to the Alewife MBTA station parking garage. Take the Red Line. Get off at the third stop; "Harvard". Allow fifteen minutes for subway portion of the trip. Drive to Riverside MBTA station in Newton, the western terminus of one branch of the Green Line (Exit 22A from Route 128), where there is an open-air parking lot. Take the Green Line to the Park Street stop. Go downstairs, following signs marked Red Line to Alewife. Take train in the direction of Alewife four stops to Harvard. Allow 45 minutes for subway portion of the trip. Take I-93 North to exit 26 (Cambridge/Storrow Drive). Keep left at end of ramp and take underpass to Storrow Drive. Continue on Storrow Drive* approximately 4 miles to Cambridge/Allston. Take the Harvard Square exit. Turn right at end of ramp onto John F.Kennedy Street. Harvard Square is approximately 1/2 mile straight ahead. Continue with directions through Harvard Square. Take I-93 South to exit 26 (Storrow Drive/North Station). Keep left at end of ramp and take underpass to Storrow Drive. Continue on Storrow Drive* approximately 4 miles to Cambridge/Allston. Take the Harvard Square exit. Turn right at end of ramp onto John F. Kennedy Street. Harvard Square is approximately 1/2 mile straight ahead. Continue with directions through Harvard Square. Take I-90 East (Mass Turnpike) to exit exit 18 (Cambridge/Allston). Bear right after toll booth at end of exit ramp. Turn left after lights (before the bridge) onto Storrow Drive. Take Cambridge/Allston exit (1/2 mile ahead) and turn right at end of ramp onto John F. Kennedy Street. Harvard Square is approximately 1/2 mile straight ahead. Continue with directions through Harvard Square. Where the Coop is on the left and Out-of-Town News on the right, continue forward on what is now Massachusetts Ave, stay in the middle lane. At the next light (Harvard Yard is on your right) stay to the right. Take the right under the underpass, follow signs toward Cambridge/Kirkland Streets. Coming up from the underpass, the road splits, stay to the left. This will bring you to a traffic light with Memorial Hall on your left and the firehouse on your right. You can either drop patrons off at the theater, or go directly to the garage and park. Go straight through traffic light on Cambridge Street. Turn right at second street (Felton Street). Entrance to Garage is on your right.